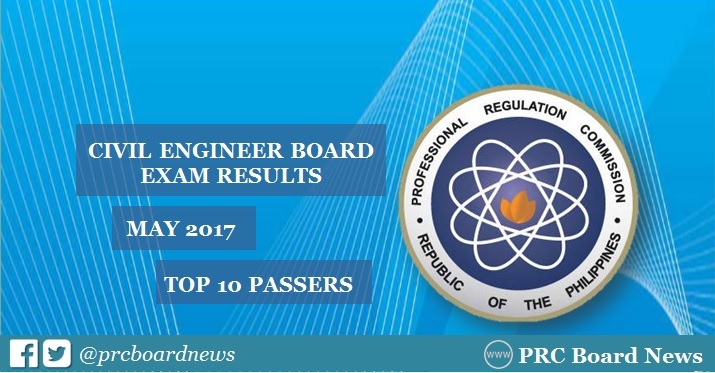 The Professional Regulation Commission (PRC) announced the list of topnotchers (top 10 passers) of May 2017 Civil Engineering (CE) board exam on Thursday, May 11 or 3 working days after the exam. Hisham Adiong Sacar from FEU-Institute of Technology led the 2,514 passers with 94.60%. It was followed by Christian Paul dela Cruz Sanguyo from Mapua Institute of Technology (MIT) who got 93.55%. The Civil Engineer board exam was administered on May 7 and 8, 2017 in the cities of Manila, Baguio, Cagayan de Oro, Cebu, Davao, Iloilo, Legaspi, Lucena, Pagadian, Tacloban, Tuguegarao and Zamboanga. On this page, check out the names of highest placers with their respective schools and ratings. In May 2016 CE licensure exam, Luvincci del Rosario Tan from Mapua Institute of Technology (MIT) - Manila topped the board exam with 93.70%. Meanwhile, Francis Arhay Pastores Luz from Lyceum of the Philippines - Gen. Trias, Cavite aced the May 2015 licensure exam with 93.35%. Also from MIT, Harvey Alcantara Malolos ranked first in the May 2014 civil engineer board examinations, 95.10%.